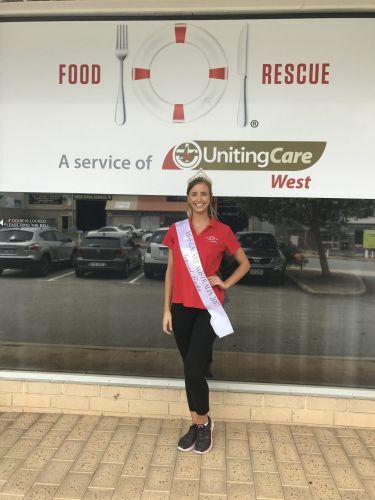 Dianella resident and Miss Galaxy hopeful Alicia Van Schoonhoven at Food Rescue. DIANELLA resident Alicia Van Schoonhoven says competing in Miss Galaxy was not all about looking beautiful on stage, rather, it was focussed on community work. The 21-year-old will have a second crack at the Miss Galaxy Australia titles on the Gold Coast, after she was one of six selected at the WA final in December. If she wins the national competition, she will be flown to Florida in the United States to compete in the international titles. Ms Schoonhoven, an Edith Cowan Cowan University health science student, said she modelled when she was younger and started doing pageants in 2013. Featuring fashion wear, swim wear, evening wear and interview rounds, in 2015 she got to the top 10 at the Miss Galaxy national competition. “It’s all about philanthropic work and charity work, it’s not just about looking beautiful on stage,” she said. Ms Schoonhoven volunteers with Belmont’s Food Rescue, a UnitingCare program that aims to alleviate hunger in disadvantaged WA people. She also volunteers at Kidzucate, a program that’s promotes the prevention of behaviour that is harmful or abusive for children. Ms Schoonhoven was also selected this month as the face of Sax Sea Boutique in Hillarys Boat Harbour. She said she hoped to create her own non-profit organisation focusing on promoting positive mental health and living fulfilling lives, after struggling with depression and anxiety herself.